Research on the microstructure of foreign exchange (FX) has established the importance of private information for the determination of exchange rates. But private information is, by definition, unobservable. In social media, large numbers of people directly express their opinions about the direction of asset prices. Other studies, such as Antweiler and Frank (2004) and Das and Chen (2007), have investigated information content of online messages. In our recent work, we investigate the information content of opinions on one asset price, and ask how profitable trading based on this information would be (Gholampour and van Wincoop 2017). We focus on opinions posted on Twitter, because Twitter is widely used to express opinions about asset prices. Several anecdotal stories suggest that this information can be important. For example, on 13 August 2013, Carl Icahn, an activist investor, tweeted about his large position in Apple. As a result, Apple shares increased in value by more than 4% in a few seconds. We investigate what can be learned from Twitter by considering two and a half years of tweets that expressed opinions about the euro-dollar exchange rate. The results of other studies are based on regressions of stock price returns on either ‘mood’ states (hope, happy, fear, worry, upset) or an opinion about the direction of stock price changes. At best, there is limited evidence of predictability in most of these studies, which is not surprising because they are based on short data samples. The main difference in our approach was the use of a model to leverage the short sample and learn about the information content of the messages from different moments of data. We developed a dictionary designed specifically to capture the vocabulary that investors use to express their opinion. Related literature uses the Harvard dictionary, which is not structured to classify messages related to the financial markets. Data-only approaches to investigating the information content of online messages have significant limitations because they apply short data samples to asset prices that are volatile and hard to predict. In addition, opinions about future asset prices expressed through social media are usually directional: positive, negative, and neutral. They do not specify the magnitude of the expected change, or the horizon. The same is the case for our Twitter sentiment about future exchange rate changes. We aim to learn from data on Twitter sentiment and exchange rates through the lens of a model with a precise information structure. This was necessary because, in the absence of a model, the sample is too short to draw conclusions about predictability and Sharpe ratios. We find that the direction of exchange rate changes is predicted by tweets in a way that is statistically significant. This suggests that there was information content in the tweets. But we also find that Twitter sentiment does not predict the magnitude of future exchange rate changes in a statistically significant way. Such predictability would be needed to develop trading strategies from this data. This absence of predictability based on a data-only approach is not surprising, because exchange rates are notoriously hard to predict. Twitter sentiment is only directional, and the data sample covers only two and a half years. We use Twitter’s publicly available search tools since 9 October 2013, to download tweets, in real time, every 30 minutes. We start with all Twitter messages that mentioned “EURUSD” in their text and were posted between 9 October 2013 and 11 March 11 2016. Then, several steps are taken to construct a daily Twitter sentiment index (TSI) from the verbal tweets in the data. Opinionated tweets are identified and classified as positive, negative and neutral using a set of word combinations. The word combinations are based on language typically used by traders in the euro-dollar market. A score of +1, -1 and 0 is assigned to positive, negative, and neutral tweets, respectively. Each opinionated tweet is then assigned to a group based on the number of followers of the account that posted the tweet. Tweets posted by accounts with more than 500 followers are placed in an 'informed' group, and those posted by accounts with less than 500 followers are assigned to an 'uninformed' group. The daily TSI of the 'informed' and 'uninformed' groups are the simple average of the numerical score that is associated with opinionated tweets in each group. The key methodological distinction of our approach is the use of a model, with a precise information structure, to interpret opinions captured by Twitter sentiment. The model we use is an extension of a noisy rational expectation (NRE) model for exchange rate determination developed by Bacchetta and van Wincoop (2006). The model allows us to interpret many aspects of the Twitter sentiment data, such as volatility, disagreement among agents, the relationship with current and future exchange rates, correlation between the sentiment of the informed and uninformed group, and the different information quality of informed and uninformed agents. We make no assumption in the estimation of the model about which group is informed, but the results showed that those with more followers gave higher-quality private signals about future fundamentals of the exchange rate. Since the model provides a good representation of the Twitter data, we use it to compute the Sharpe ratio of a trading strategy that would take daily long/short positions on the exchange rate based on the daily TSI. Predicting exchange rates is not easy. Meese and Rogoff (1983a, b) showed that the exchange rate is close to a random walk. Engel and West (2005) showed that reasonable estimates of the discount rate of future fundamentals in exchange rate models are a near-random walk. There will always be limited predictability, no matter how good the private information was. In our data sample the Sharpe ratio for the informed is 1.09, but with a large confidence interval of [-0.09, 2.27]. 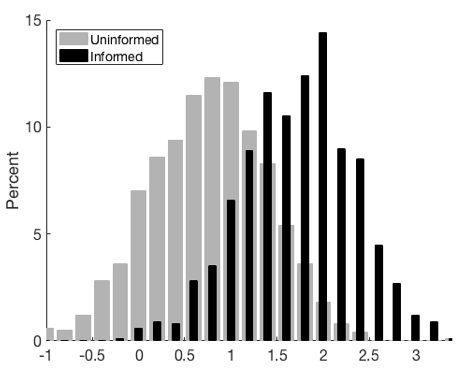 Figure 1 shows the distribution of the Sharpe ratio for both the informed and uninformed group, based on 1,000 simulations of the model over 633 days, using the estimated parameters. It demonstrates why a 633-day sample of data, without any model guidance, tells us little about the Sharpe ratio. The average Sharpe ratio across simulations was 1.68 for the informed group, but there was a large standard error. If the model is correct, the Sharpe ratio in the data for a 633-day sample can be either very large or very small. After we estimate the parameters of the model, we compute the Sharpe ratio by simulating the model over a long sample, instead of just 633 days. The only remaining uncertainty about the magnitude of the Sharpe ratio is associated with the standard errors of the estimated parameters based on the 633-day sample. We are able to estimate the parameters of the model with great precision, translating this into the precision of the corresponding Sharpe ratio. Table 1 shows that the Sharpe ratio for the informed group is, on average, 1.68 with a 95% confidence interval of [1.59, 1.78]. Our model significantly reduces uncertainty about the level of the Sharpe ratio. The large Sharpe ratios that we find suggest that there are significant gains from trading strategies based on Twitter sentiment. We can compare the Sharpe ratio from the TSI trading strategy to that of the popular currency carry-trade strategy based on interest differentials. Burnside et al. (2010) reported an average annualized Sharpe ratio of 0.44 for 20 currencies against the dollar based on a carry-trade strategy. A Sharpe ratio in the range [1.59, 1.78] is clearly very high by any reasonable standard. The methodology developed here could easily be applied to other currencies or portfolios of currencies, as well as other financial markets such as the stock market. Antweiler, W and M Z Frank (2004), “Is All that Talk Just Noise? The Information Content of Internet Stock Message Boards,” The Journal of Finance 59 (3), 1259-1294. Burnside, Craig, M Eichenbaum, I Kleshchelski and S Rebelo (2010), “Do Peso Problems Explain the Returns to Carry Trade?” Review of Financial Studies 24(3), 853-891. Engel, C and K D West (2005), “Exchange Rates and Fundamentals”, Journal of Political Economy 113(3), 485-517. Gholampour, V and E van Wincoop (2017), “What Can we Learn from Euro-dollar Tweets?” NBER working paper 23293. Meese, R A and K Rogoff (1983a), “Empirical Exchange Rate Models of the Seventies: Do They Fit Out of Sample?” Journal of International Economics 14, 345-373. Meese, R A and K Rogoff (1983b), “The Out of Sample Failure of Empirical Exchange Models,” in Exchange Rates and International Macroeconomics, edited by Jacob A Frenkel, Chicago: University of Chicago Press (for NBER).